Job fit assessments help you make better hiring decisions by helping you understand the core characteristics of your top performers. There is no greater tragedy in business than hiring competent employees into jobs in which they are destined to fail. When this happens, their potential is wasted. Hiring solutions measure the essential behavior characteristics an employer needs to make the most intelligent hiring and selection decisions. Job fit assessments help talent acquisition professionals and hiring managers predict job suitability, and accurately helps assist in matching people with the work they will do in their new jobs. Today, many organizations use job fit assessments throughout the interview process to learn more about job candidates. There are many kinds of employee assessments available, but the most successful hiring assessments use job fit as a tool to increase consistency and success in the hiring process. Job fit solutions combine tested and reliable data derived from employee assessments with customized data to create a benchmark, which will match candidates to the job and specific company.. By including job fit as a key factor in your employee selection process, your hiring procedure will be significantly more effective. Based on objective criteria, management teams select top performers in a given position. 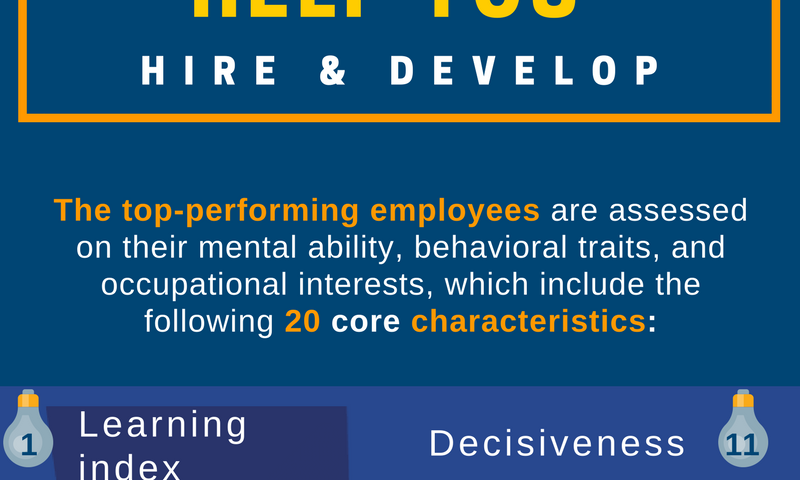 The top-performing employees are assessed on their mental ability, behavioral traits, and occupational interests, which include the following 20 core characteristics: This data is used to create a unique job fit profile, becoming the foundation for the skills and characteristics required by your company for selecting and hiring talented people. Candidates applying or under consideration for a job take the assessment to produce their behavioral profile. Then, their profile is compared to the performance model for the job. This helps determine where the candidate shares common characteristics to top performers, and where they differ. In addition to providing information about a candidate’s personality type and behavioral characteristics, the job fit assessment will provide customized, tough interview questions that are prepared specifically for a particular candidate, based on their assessment results. These specific interview questions, which follow Department of Labor guidelines for fairness in hiring, can be used in the second interview. This gives managers a critical advantage in the hiring process. Using employee assessments in your hiring and selection process will give you a competitive edge, increasing consistency and success in hiring talented employees. Matching people with the work they do creates a solid workforce that has the right people in the right positions.